Finally, students should be encouraged to develop their own original tessellations in the Escher style. Doing so will definitely increase their admiration for Escher and the many contemporary artists who work in this field. The shapes are rather easy to create. The inspiration to see the character hidden within is a greater challenge for beginners. While the true artists most likely begin with the end in mind, beginners usually create a piece then try to figure out what they have created. This process guarantees a lot of fun and many laughs as students rotate and flip their shapes to figure out just what they could be. Be sure to include the Develop Escher Eyes activity, listed below, before students attempt their own original tessellations, using the directions also found below. Visit the Escher Galleries on the Tessellations.org website to view many examples of Escher's art. These directions support students as they create tessellating pieces that slide to tessellate the page. Creating the tessellating piece is the easy part of this activity. Students traditionally have a tougher time deciding what their creation can be. Use the suggested ideas to help students develop an Escher eye for form. 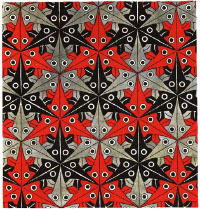 Help students Develop Escher Eyes to identify the hidden creature(s) in their tessellating pieces. Remember days of cloud watching where you tried to find shapes in clouds? Replicate this experience by placing the cut-out tessellation pieces on an overhead and rotating or flipping them to encourage students to think outside the box and identify many possibilities for their original form. This is an excellent introductory activity before students create their own Escher-type tessellations as it helps students see the possibilities in their own shapes. Project the images so that the whole class can brainstorm together! Encourage students to go for quantity as they try to see many different possibilities in the same shape. See Directions for creating an Escher-type tesselation. The original PowerPoint file was converted to PDF format for easy viewing. Teachers may use this document to lead students step-by-step through creating their own original tessellating pieces. Tessellations.org is a great resource for teachers introducing tessellations to students. Use a large screen to show the tessellation explanations, then use the illustrated directions to have students create their own tessellation designs. Math Forum's Tessellation Tutorials explain tilings, and the math behind tessellations. Tessellate! is an online application that enables students to easily tessellate and color in a plane. Virtual Manipulative: Tessellations also enables students to tessellate regular geometric shapes. Symmetry and Tessellations examines symmetry and tessellations in various real-world applications such as nautical flags, hubcaps and quilts. Intriguing Tessellations showcases Marjorie Rice's artwork and the math underlying her tessellations. Tessellating Alphabet presents a specially-designed alphabet. Students click on any letter and immediately see that letter tiled across a plane. Bill's Artwork contains both periodic and aperiodic tilings. The collection also includes animated tessellations that will amuse students. Have students view the work of Makoto Nakamura for additional design inspiration. Be sure to select different artists from the database drop-down menu to examine additional tessellation styles. Students will especially enjoy the animated examples in the Tessellation World of Makoto Nakamura.